Contact us at 866-728-1525 to find out how you can become a distributor of Label Mark-It. 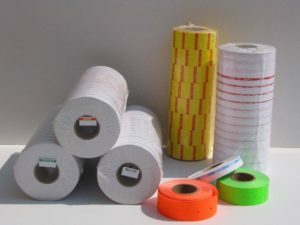 Our product line is continuously expanding, please contact us for any labels your customers are in need of. We also stock a full line of price marking tools. All labels are manufactured by Label Mark-It, Inc. and are not made, sponsored, or affiliated with Avery Dennison®, Monarch® Marking Systems, Paxar® Americas, Inc., Garvey® or Cosco® Industries Inc., Sato®, Meto®, and Checkpoint® which are all trademarks. *Indicates a trademark of Monarch Marking Systems, Inc. These labels are not made or sponsored by Monarch Marking Systems, Inc.
XL®Pro is a trademark of Paxar Americas, Inc.